100% PROTECTIVE NEOPRENE MATERIAL Two bottle wine carrier made of thick neoprene material to keep bottles safe during airline travel or outdoor events. The multi-layer protective material shields bottles from banging and breaking, providing peace of mind when traveling. Detailed stitching separates sleeves, guaranteeing bottles will not bang against one another. KEEP BOTTLES COOLER FOR LONGER. Neoprene material, known for its use in wetsuits, keeps bottles heavily Insulated and cooler for longer. The thick protective thermal coating provides that bottles stay chilled for hours to ensure an enjoyable experience. Full cover provided to bottles for definitive cooling Insulation during warm weather. EASY FOR TRAVEL & STORAGE. Lightweight portable wine coolers weigh 4.5 Oz and are easily stored in suitcases, backpacks, and day Bags. Material is easily foldable to fit into any size luggage and tote pattern will not wrinkle. Soft and sturdy grip provides a comfortable clutch when transporting bottles. Snug fit guarantees bottles will not swing while carrying. 100% MACHINE WASHABLE. 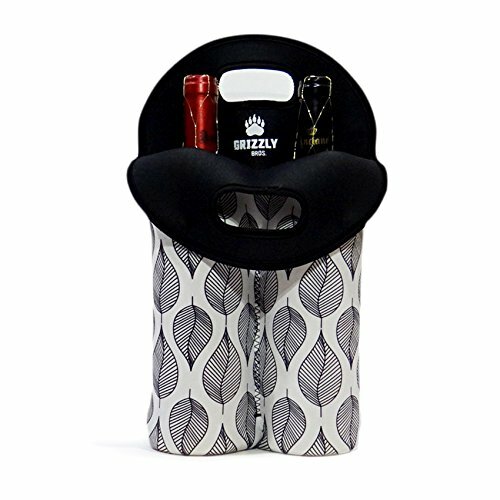 The GrizzlyBros wine carrying case material provides that this product can be easily rinsed and dried for quick and stress-free cleaning. The multi-layer protective insulation guarantees no tearing or ripping during machine-wash and patterns will not bleed. LIFETIME MONEY BACK GUARANTEE. There is no risk when purchasing. There is absolutely no need to worry about receiving a damaged or unusable product as we promise to return your money if you are not happy with your purchase. See the reviews for proof.